Maximizing Progress: Skynet Self-Aware ~ You've Been Terminated! 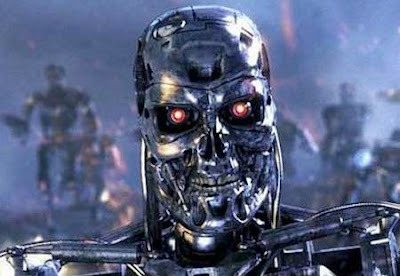 Thanks to Liz Kelly Nelson in Zap2It for reminding us April 19, 2011: Skynet becomes self-aware tonight! "...per "Terminator" lore, the vast network of computers known as Skynet became self aware at 8:11 p.m. and slowly began a systematic campaign to rid the earth of humans. Somehow they weren't smart enough to do a better job than the average pest control guy does with roaches, so they resorted to creating "terminators" -- cyborgs that looked like 'roided-out bodybuilders, infiltrated our "nests" and then blasted our kind into bits." Yes, this was the Governator's breakthru SF movie role!